French Wine Scholar – Burgundy and its Complexities! Hello wine lovers and happy wine Wednesday! I hope it is starting off to be a banner week for you. I had a fun phone interview this morning with a Southern Californian based newspaper who interviewed me as their up coming featured ‘Wine Blogger’. It was interesting and cool to be on the ‘other side’ and was the one answering the questions rather than doing the asking! It is going to run Feb. 2nd and I will post the link for you. Last night in my FWS, we tackled Burgundy. OMG. I had an idea with my WSET classes that Burgundy is a complex and multi-dimensional region in France but lets just say that in 3 hours, we focused only on the reds ( namely Pinot Noir and some Gamay ) of the Côte de Nuits and the Côte de Beaune. We didn’t cover Chablis, Côte Chalonnaise or the Mâconnais. This region is so incredibly detailed and specific and varied that the class flew by and I didn’t want it to end! 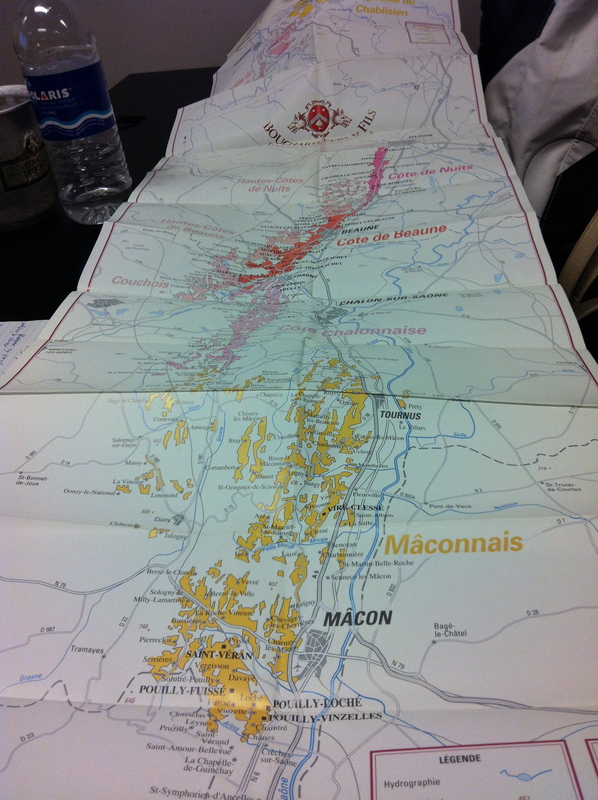 The detailed (OMG) map of the Burgundy region! Burgundy is a very ‘terroir’ specific region with over 400 soil-types. The monks in the 9th century were instrumental is writing down the fact that the same grape variety tasted ‘better’ in certain locations on the slope. They gave us the first documentation and detailed account of the fact that soil, aspect, and location on slope (mid-slope is best) all matter to the finished result. Burgundy is located two hours from Paris and one hour from Lyon and runs 224 KM north to south. It is the 4th largest wine region in France yet contains more AOC’s than any other region! The main grape varieties are Pinot Noir and Chardonnay and Burgundy lays claim to some of the most expensive wine in the world. For example, there are 5 bottles in the B.C. Liquor Store of La Tache – Domaine De La Romanee Conti 2005 vintage that goes for $8,500 a bottle. Yes, you read that right. However, you don’t need to spend close to $10,000 for a great bottle of Burgundy and I was introduced to a few bottles that were pleasant to drink and enjoyable. In Burgundy, I learned it is also so very much about the wine producer as it is about the wine. Vintage is very important here too and it was suggested that we look out for 2009 and 2010 Burgundy vintages as they are still a pretty good value and they were great vintage years recently. I am only scratching the surface here with how much information I crammed into my brain last night – so please forgive me. I may try to delve a little deeper in the week and post again but it may just be a post next week about the whites as well as the other Burgundy regions we did not cover this week. 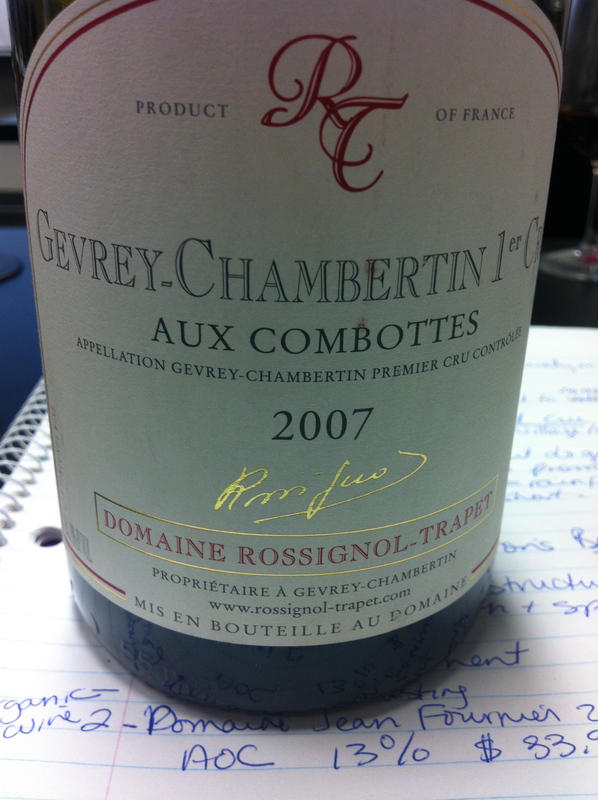 Domaine Rossignol-Trapet ‘Aux Combottes’ 2007 Gevrey-Chambertain Premier Cru AOC (13%) $78.00 at Marquis Wine Cellar on Davie Street, Vancouver. A great ‘value’ vineyard as it is located between two Grand Cru vineyards and is most likely undervalued. Nice and smooth with strawberry and spice. Drink now. Domaine Taupenot Merme 2011 Bourgogne Passe-Tout-Grains AOC 12.5% abv. $20.00 This is an easy and basic expression of Burgundy and a blend of Pinot Noir and Gamay. It is a good starter wine to start understanding this region. Flavours of strawberry, earth and spice. Nice. ‘Domaine’ Louis Jadot ‘Les Avaux’ 2005 Beaune Premier Cru. $76.00 My favourite of the bunch last night. This is a 2005 vintage with still about 5 more years of aging to be had! Juicy and delightful with smooth, integrated spice and red fruits. Delicious. Thank you for coming along on my journey with me. I write for you and I so enjoy your comments, feedback and questions. Have a wonderful week! How very interesting, the Chevrey Chambertain is the wine I brought back from France and you tasted it with me, it brought back lots of delightful memories. Sounds like you are doing awesome. Congrats! Dundarave Wine Cellar at $58.49/bottle when buying a case or more. and easy to get along with. Thank you so much! It was great to connect with you during the FWS program. What is your next journey? I am thinking about a Master’s in Rhone or Alsace. I look forward to staying in touch!